While reading the complete works of William Shakespeare, I made frequent comments about him and his works on Facebook, some of which I here reproduce. In which I critique Cleopatra. In which I mourn a death. In which I express a foreboding. 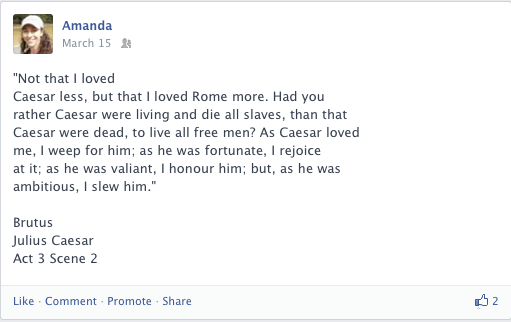 In which I critique Antony. In which I state a fact. 5. A deathbed confession and a crazy countess. 4. A buried treasure in a graveyard. 3. A duel fought with pistols. 2. A midnight funeral in a ruined abbey. 1. A nighttime rescue of persons stranded by a high tide on an oceanside cliff in a storm. During my long project (2 years, 9 months, 18 days) to read the complete works of William Shakespeare, I made frequent comments about him and his works on Facebook. Here is a selection of posts from March 2013. 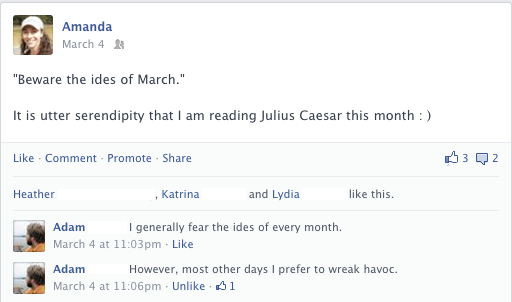 How fortuitous that I got to read Julius Caesar during the month of March. The deed is done and explanations are made. An exclamation that should come back into common usage.